imtech design Moldflow Consulting Services operates the full suite of Moldflow CAE programs to identify injection molding defects and remedies advice using Moldflow simulation on the smallest medical device to the largest car instrument panel quickly and efficiently. Our consulting service provides you with practical solutions to complex injection molding problems. We also offer a 24 hour service that provides you with important molding information quickly so you can proceed with confidence. We offer services for the medical industry, automotive, telecommunications, and more. See Why choose us? We recently deveoloped a free problem solving and materials seach program, i-Moulder runs on apple iPhone and iPod Touch and now on Android smart phones. Materials Information, Problem Solving Guide, Manufacturers Database, Industry Tools & Conversions. How will a MoldFlow Simulation benefit me? Optimum Cooling for Cycle Time Savings. Position Weld Line Where You Want Them. Runner Balancing for Minimum Scrap. Why? : Reduce development time, Save money and make Your Life Easier. The plastics injection molding process is integral to many of today’s mainstream manufacturing processes. Industries such as telecommunications, consumer electronics, medical devices, computers and automotive all have large, constantly increasing demands for injection molded plastic parts. There are thousands of different grades of commercial of plastics materials with widely varying processing characteristics and complex part and mold designs are constantly pushing the limits of the process. Click for video. The production of injection molded parts is a complex process where, without the right combination of material, part and mold design and processing parameters, a multitude of manufacturing defects can occur, thus incurring high costs. Plastic Flow Simulation. (moldflow) Computer aided engineering (CAE) tools are used to simulate the manufacture of plastic parts and the results help our engineers correct defects on the final design, before mould tool manufacture is completed. The above factors bring a level of complexity to injection molding that makes it necessary to use Moldflow CAE tools to predict and solve potential problems before they occur. Additionally, the cost of tooling for injection molds can be very high and subsequent rework increases these already high costs. All these factors combine to make injection molding an ideal application for CAE simulation using Moldflow. Imtech Design has been providing answers to complex moulding problems using Moldflow software for 21 years and able to supply quick practical solutions to keep your plans on track and within budget. Efficient Cooling Reduces Manufacturing Costs. Applying Moldflow Mpi software to cost reduction is our most sought after area of expertise. 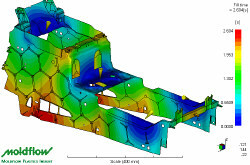 Wall thickness optimization and efficient mold cooling can reduce cycle times by as much as 20 percent. The payback is normally very quick and is multiplied many times over during the life of the product. Production rates are up, energy costs and machine times are significantly reduced. View our mold cooling page for more information. Click for Cooling Optimization. . Going green increases your profits. imtech design has the experience and depth of knowledge of the Moldflow system to competently help our customers turn more plastic into profit. The injection molding process itself is a complex mix of time, temperature and pressure variables with a multitude of manufacturing defects that can occur without the right combination of processing parameters and design components. Because of these complexities, today’s plastic part and injection mold designers are under tremendous pressure. Project timelines are being compressed; scaling to high-volume production at times occurs literally overnight; there is a push to ever thinner-walled molding; mold design, mold making and manufacturing often occur across fragmented geographic locations. Moldflow Plastic Adviser, Plastics Insight, Moldflow Mpi, Mold flow communicator and Mold Adviser are Mould flow software products for simulating the injection molding of plastic materials. Imtech use CAD Connectivity Tools to link structural CAD - CAE to MPI, MPA and MPX Community projects in the plastics and tool making industry. "Moldflow" is a registered trademark Moldflow Corporation & Moldflow Europe ltd.